If you’re the type of triathlete who likes to be fully prepared and organized (well before you even rack your bike in transition on race day), these are the triathlon checklists for you. Since triathlon involves so much equipment and, depending on the length of your race, can also involve detailed hydration and fuel prep, we offer these lists to help make race morning less chaotic. The week before the race can feel like the doldrums—with a reduced training plan due to tapering and plenty of free time, you may find yourself stressing more than usual. Here are some helpful tasks to keep you focused and help eliminate any surprise emergencies. Replace worn tires and old tubes on your triathlon bike. If it looks bad, replace it. Make sure you have everything thing you need on your bike to fix a flat. Check your running shoe laces and change them out to elastic slip-on lock laces if you usually race in them. It’s also a good idea to pack an extra swim cap just in case they are not provided, and bring an extra pair of goggles. Best case, you may be able to help a fellow racer who is in need. 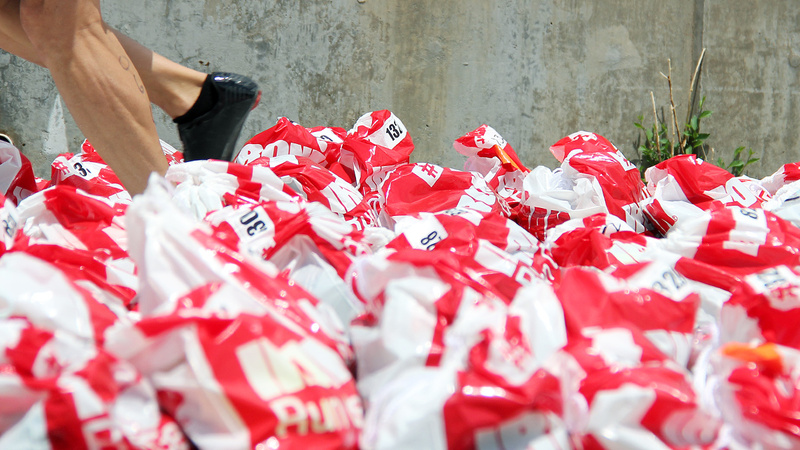 Finalize your pre-race, race and post-race clothing. Race morning can be chilly, so be sure to have something to wear before the start. Old slippers or flip flops make great “shoes” to wear from transition to the water for the start. Check each piece of clothing you plan on wearing, from your swimsuit and/or wetsuit to your cycling/running socks. Now is the time to buy something new if necessary, so you’ll be able to test it out before race day. Will you need a visor, sunglasses or hat for the run? If so, make sure it’s something you have tested in training. You’ll also be glad to have comfortable clothes and shoes or sandals for after the race. That way you’ll be comfortable while you grab a drink and snack, chat with friends, or wait for your podium ceremony! In the days before the race, you may find yourself getting even more nervous, but it’s a great time to rest, pamper yourself with great food, and work on your visualization. Sleep well. Two days before your race is actually the most important night to sleep well, since most athletes will be too excited/nervous to get good sleep the night before. Try to use this as a rest day with very little walking or exertion. Eat the foods that you normally do. There is no need to eat more than normal, because you are training less. Revisit the race course, especially the finish line and the last section of the bike and run course. Visualize each event in as much detail as possible, including race morning, your equipment, the course, transitions, what you will tell yourself when it gets hard or when something goes wrong. In the day before the race, it’s important to make sure you hit your nutrition targets and stay calm. Your gear should all be ready, and your body is as strong as it’s going to get, so pack your bags and try to get some sleep! Avoid overeating; an overly full stomach might not digest in time for the race. Hydrate well! Now is the time to get ahead of the game. Again, visualize the race and how good you will feel. Put all your equipment in the car the night before, so you’ll be ready to go in the morning. Then, go to bed at a reasonable time and try to shut your mind off. Everybody’s race day routine will be a little different, but these simple rules will help eliminate some of the most stressful friction points of race day. Be sure to eat at least 90 minutes before your race starts, or whatever time frame you have practiced while training. Now is not the time to deviate from your usual meal plan. Try to go to the bathroom early. Dress warmly. Race mornings always seem cooler than normal! Arrive at the race site early for check in and place the necessary numbers on your body, bike and helmet as soon as you get them (to avoid losing them). Set up your transition area, including shoes, towel, helmet, sunglasses, socks. Just remember, less is more in the transition area. Clutter will make a stressful situation even worse, and ultimately waste time. It can help to use a bright colored towel to mark your spot. Do a final bike check at transition. Make sure your front wheel is facing out, your pedals are in your preferred position, and your drivetrain is in the right gear. Get your helmet, race number and shoes positioned. Place your timing chip (if included) on your left ankle. Warm up, get out there, give your best effort, and have fun! This is what you have been training for!